I recently ran a survey for a client to find out who people think Britain’s greatest technology pioneer is – and since the idea never got used, I thought I’d share the results here. 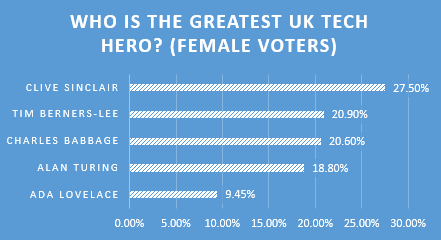 We used Google Consumer Surveys to ask 1,000 UK internet users who Britain’s greatest tech hero is and gave them a list of some of the most obvious contenders, as well as leaving an open option for them to suggest other pioneers. It’s completely unscientific and just for fun, but I don’t think people would disagree with the findings too much. 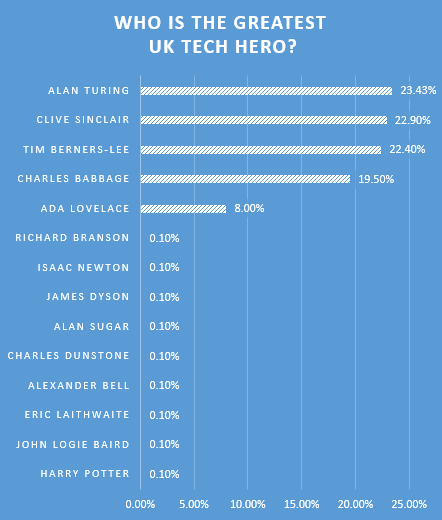 It’s hard to argue with Alan Turing taking the top spot, although some might wonder whether Clive Sinclair deserves more votes than Tim Berners-Lee. That said, we shouldn’t underestimate the impact that the ZX Spectrum had on an entire generation of techies, inspiring millions to experiment with their first computers and learn about coding. What surprised me was that there was such a slim margin between the top four – even today it still seems that people value the early contributions to computing made by Charles Babbage and, to a lesser extent, Ada Lovelace. The results become a little more interesting when we look at the difference between male and female votes. First, if we focus on the results from the 320 women who participated in the poll we see very different rankings – women really seem to rate Sir Clive. 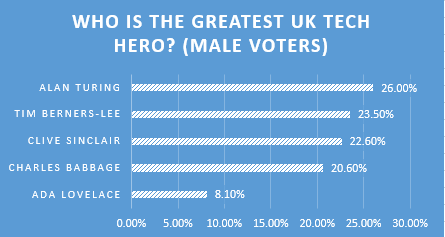 Male voters, on the other hand, were more likely to rate Alan Turing as our greatest technology hero.